For the performers — members of the seventh grade band at Nativity of Our Lord Catholic School — this was not a typical school concert. For starters, it did not take place at their school in St. Paul but rather after school, a few blocks away. They played as a small 15-piece ensemble rather than as a full seventh and eighth grade combined band. And the audience comprised dozens of elderly people living at Carondelet Village, a complex consisting of senior and assisted-living apartments in addition to memory care and skilled nursing care units. Harmony Bridge is the school-based program that brought together these young musicians and senior citizens. Founded by Michael Levine, a native Minnesotan and professional trombone player, Harmony Bridge encourages elementary, middle and high school band students to share their musical talents with local seniors. Special color-coded musical arrangements provide all groups of instruments with opportunities to “solo” and typically feature familiar melodies, such as American folk songs, that resonate with older audiences. “With Harmony Bridge, we’re pushing past the traditional mold of just playing a Christmas concert and a spring concert. We’re giving students more opportunities to get out into the community and play their instruments in a more informal environment, which they love to do,” said Troy Newlove, who introduced the program in 2017 when he became Nativity’s instrumental music director. Of Nativity’s 825 students in grades preschool through eighth, 110 participate in the instrumental music program, which spans fourth through eighth grade. 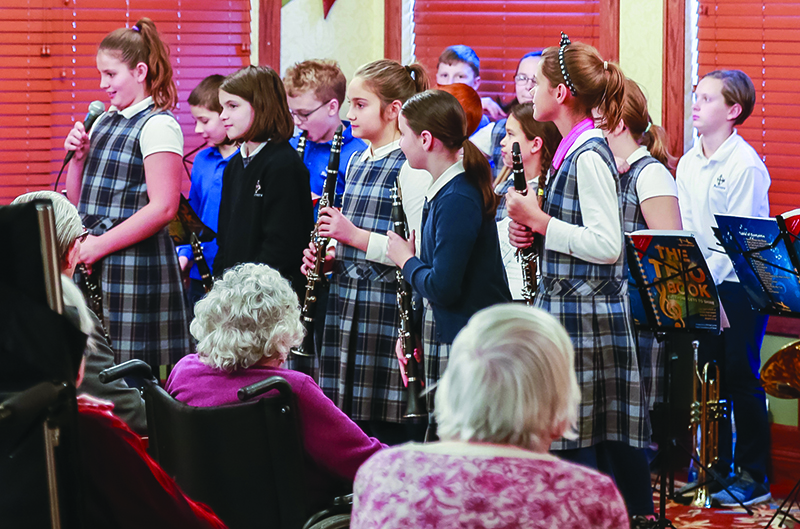 Each of those grade levels performs at least one Harmony Bridge concert during the school year at various senior care facilities throughout St. Paul. That hug, or simply hearing a favorite song, might be the highlight of someone’s week or even month. For some of the residents, Newlove noted, a Harmony Bridge concert might be the first time they’ve interacted with a child in a long time. “We see lots of smiles, which shows the value and power of music, of how therapeutic it can be,” he said.